Soliciting advice from experts and peers is important for all small business owners who want to build and grow their businesses. While there are plenty of networking events to attend both nationally and locally, the internet has allowed for mentoring relationships to be formed easily online as well. Small business discussion groups can be free or paid; they can be hosted on private websites or part of social media like Facebook and LinkedIn. 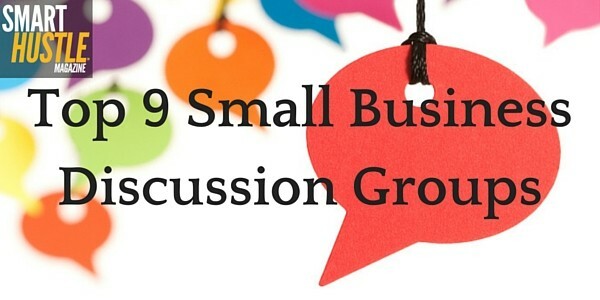 Below we have a list of the nine top small business discussion groups that you should join today. Launched in early April, the Smart Hustle Community group on Facebook already has 200 members and lively discussions. The group was created so small business owners could both ask questions and give advice. Smart Hustle team members also participate regularly, and there are weekly live video sessions with Ramon Ray. The Small Business Forum boasts over 100,000 members. The forum is divided into sections like Your Small Business, Financial & Legal, Marketing, and Your Website. Members can sign up to post new threads and also share their insight by commenting on existing threads. The Startup Nation website has information on “everything you need to build your business.” The community section is forum-style, with categories such as Business Basics; Marketing, Sales & Public Relations; Money; Doing Business on the Web; Running Your Business and more. Each section is divided into subtopics making it easy to choose the best place for your questions and answers. ShankMinds is a group created by Peter Shankman, an entrepreneur, author and angel investor. The group allows people who are in the process of building their business to pick the brain of Peter and get real-world feedback on their ideas. It includes “Daily Brain Candy” (articles, blog posts, podcasts, newsletters, etc. ), a community of 300 peers who are on the same path as you, and once-a-week live coaching session where Peter devotes two hours to answering your questions and discussing your business ideas. #Entrepreneurs get all the advice you need in one of these 9 Best Discussion groups for #smallbiz. Adrian’s Network is a group created by Adrian Miller, a sales and business growth consultant, trainer, and author. The group offers ‘freestyle networking’ and the ability to form relationships with like-minded business owners. It features 10 networking opportunities each month and gives you access to all members so you can form and cultivate relationships. The Social Media Examiner Society is for small business owners who specifically want to learn more about social media. In addition to a members’ community, you’ll have access to experts and dozens of training sessions. They also do three original, live training sessions each month that teach you about the latest social media techniques. This LinkedIn group has an impressive following of almost one million members. It is moderated by 48 professionals who ensure that the community is spam-free. There are also 20 subgroups for special interests, which includes areas like social media marketing & nonprofits, social media & politics and more. The administrator of this LinkedIn group is Dharmesh Shah, the founder, and CTO of Hubspot. Over 500,000 members contribute to discussions on topics such as marketing, sales, finance, operations, hiring and other startup and small business topics. This LinkedIn group is “for the entrepreneur, founder, & small business owner” and includes over 115,000 members. Members are encouraged to share ideas, advice and information on topics such as strategy, opportunities, development, online marketing, web design, accounting and more. Do you know of any other helpful small business discussion groups online? We encourage you to share your favorites in the Smart Hustle Community or on our Facebook page.